Red Yacht Design in Istanbul, Turkey has come up with a concept for a fast superyacht tender with distinctive automotive styling. 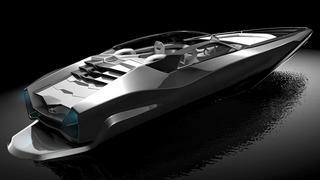 Fusion is an 11.4m four-person power boat especially designed for superyacht owners to have some fun at high speeds. There is one cabin with a bathroom and a kitchen area so she can accommodate two people onboard for an overnight stay. Based on the Lamborghini Gallardo series, her two 450hp diesel engines linked to pod drives mean she can reach speeds of 47-48 knots. Bigger engines can be specified to exceed 50 knots. Fusion will be built in hybrid carbon fibre, epoxy resin and high density PVC foam. There is a sunbathing area that can be used while not cruising at high speed and the seats in the cockpit are specially designed in accordance with the look of a racing car.